Precise measurement of line signal frequency is very important in many applications, especially in the management of power grid systems. Tasks like calibration of governors of engines that run generators in power plants need a resolution up to 0.01Hz. Frequency is also an important parameter in load sharing among several power plants in the grid. Presented here is a line frequency meter, that does it for you. When the required resolution of the displayed frequency is 1Hz, the instrument becomes simple. Direct frequency counting is one of the many possible methods as shown in Fig. 1. However, when the resolution required is other than 1Hz, like, say, 0.1Hz or 0.01Hz, value of frequency is obtained from its period. Period is measured in microseconds and frequency is calculated from it. But this method suffers from errors caused by zero-crossing detectors. In Fig. 2, input conditioning is mainly a zero-crossing detector that produces a pulse for each zero crossing of the sine wave. But here, errors can be caused by comparators whose threshold value may change due to temperature. Also, hysteresis present in the comparator can cause detection errors. Fig. 3 shows the cause of error in the measurement of the period of a signal. Reciprocal counter is a class of counter that makes a period measurement on input signal. But it does not use a single- or multi-period counter. Instead, it uses two counters called event and time. Value of frequency can be displayed directly by taking the reciprocal of the period measured as shown in Fig. 4. 1. Integral cycle of input signal cycles is used so that ±1 quantisation error is eliminated. 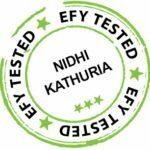 This prevents comparator errors from affecting accuracy. 2. Higher resolution is obtained without a long measuring time. A generalised frequency meter with reciprocal counting is shown in Fig. 5. An exact number of input cycles are counted in event counter and, simultaneously, the reference clock is counted in time counter for the same duration. where Ns is the number of cycles of the input frequency (50 counts in this case) and Ts is the period of the input signal. 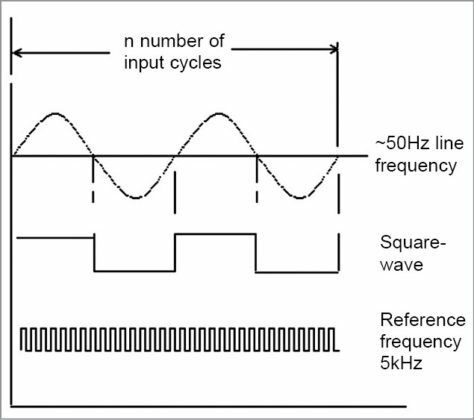 Nr is the number of cycles of the reference frequency counted within this time and Tr is the period of the reference clock (0.2 milliseconds or 0.2ms in this case). That is, to obtain a resolution of 0.01Hz, value in the display will be 50.00. 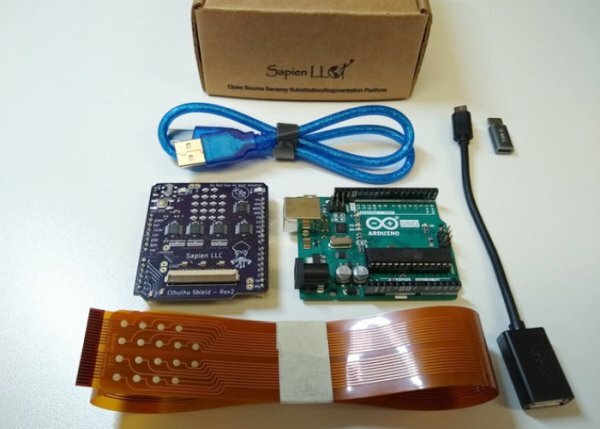 Arduino Uno is an excellent platform for the measurement of line frequency using the reciprocal counting method. 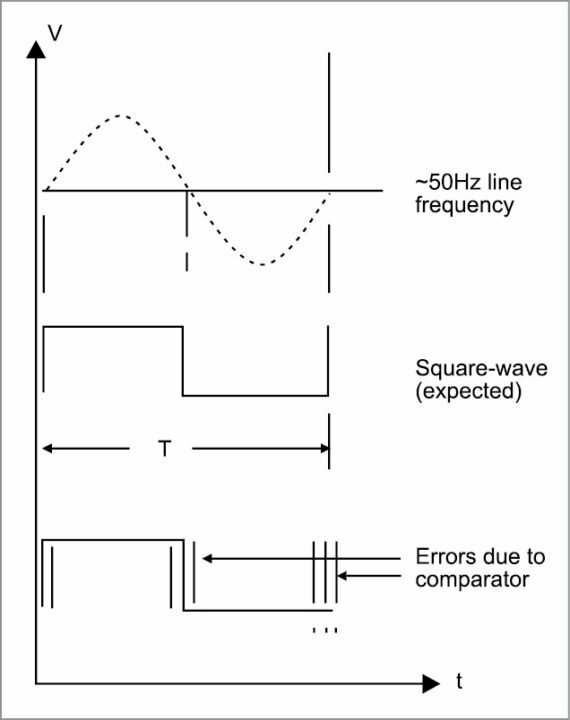 A simplified block diagram of the line-frequency meter is shown in Fig. 6. In this figure, line-voltage sine-wave is converted into a square wave of TTL levels using only a transistor. This is sufficient because the event counter counts only integral cycles and that eliminates zero-crossing errors. This square wave is applied to port pin 6 of Arduino Uno. Square-wave cycles are counted by the software and the event counter. Clock frequency for the time counter is obtained from Arduino itself by the use of Tone() function in the Arduino code as explained in software section. This signal is applied to counter T1. 1. Event counter software counts exactly 50 cycles of the input signal. 2. Time counter simultaneously counts the number of reference pulses. 3. A simple reciprocal calculation then finds the frequency. A counter similar to the circuits based on ICL7217 or NS74C926 can be used as a four-digit display for Arduino Uno (Fig. 7). For example, if 1234 has to be displayed, all that is needed is to send 1234 clock pulses. But these counters (7217 and the like) require three signals: reset, latch and clock. That will take three pins of Arduino. A special counter named ICOUNT is available from a manufacturer in Madurai, Tamil Nadu. This counter requires only one port pin from Arduino. Reset and latch signals are automatically generated by ICOUNT. The number to be displayed is transferred from any available output port of Arduino as a train of pulses. When pulses stop to arrive, the display is updated. Circuit diagram of the line-frequency meter with reciprocal counting is shown in Fig. 7. 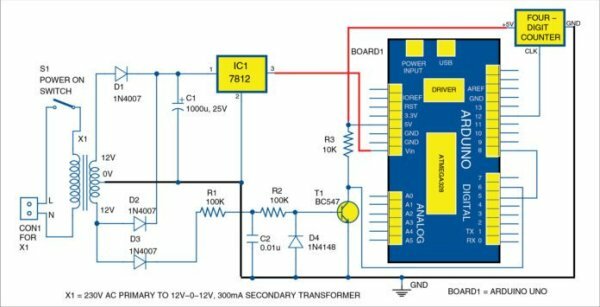 A 230V primary to 12V-0-12V, 300mA secondary step-down transformer (X1) is used for the power supply input and to get a signal to drive transistor BC547 (T1) that provides a square-wave output corresponding to line-frequency input.